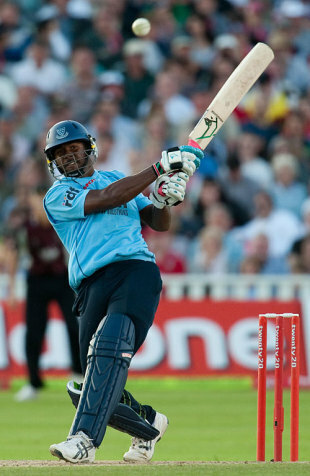 Sussex secured the Twenty20 Cup for the first time as their spinners followed up a hard-hitting display from Dwayne Smith, who clubbed 59 off 26 balls, to complete a 63-run thrashing of Somerset. When Marcus Trescothick launched Somerset's pursuit of 173 the chase looked easy, but he fell for 33 and scoring became increasingly tough on a wearing surface. The victory compensates handsomely for Sussex's Friends Provident Final defeat at the hands of Hampshire last month and they have also turned the tables on the curse of the first semi-finalists on Finals Day. Only on one previous occasion, in 2006, had the team winning the first semi gone on to claim the title. Sides have often found it difficult to lift themselves again after the downtime, but Sussex had no such problem. On a day when overseas and senior talent played leading roles, the performance of Will Beer, the 20-year-old legspinner, was worthy of many plaudits as he claimed two key middle-order scalps in a nerveless display. If it hadn't been for Peter Trego, Beer's figures would have been exemplary. Sussex's bowlers were supported by confident catching - not always easy under the less-powerful floodlights - with Rory-Hamilton Brown steadying himself under three, including the crucial one of Trescothick. However, the pick of the catches came from the captain, Michael Yardy, who plucked out Zander de Bruyn's drive at extra cover. With that went any faint hopes of a Somerset fightback. "It was a team performance," Yardy said, "I don't think anyone had a bad game." However in the first four overs of the chase it was Sussex needing inspiration as Trescothick followed his semi-final 56 from 32 balls by smiting Luke Wright for 17 off his second over. He continued by launching James Kirtley over extra cover for six, but fell trying a repeat next ball and the game changed. Justin Langer was bowled heaving across the line and by the time spin was introduced the momentum was heading back to Sussex. Yardy and Beer stifled the scoring and desperate shots started to emerge. Trego briefly resisted before picking out long-on and, with the match in the bag, Kirtley returned to produce a triple-wicket maiden in the 17th over - two to the bowler and a run out. The last six wickets fell for five runs in 19 balls. A thrashing in any cricket. Despite the early loss of Murray Goodwin, Sussex had used the Powerplay reasonably to reach 47 for 1, but lost their way in the next four overs to slip to 80 for 4 when Ed Joyce exposed his leg stump with a paddle-sweep. However, Hamilton-Brown can count himself unfortunate that he was given lbw to Max Waller as the delivery was comfortably missing leg stump. The innings was revived by Smith who is unlikely to be available for the Champions League because Deccan Chargers, his IPL franchise, have first call. To add another twist, Deccan will now play Sussex during the tournament. Goodwin will also be absent, as he has to qualify post-ICL, and it is cruel for Sussex that their two key batsmen on Finals Day are out of service. But Smith's position is something that will become more frequent as players join multiple sides. Smith hit hard and long to reach fifty from 23 balls, connecting as cleanly as Trescothick. He took a particular liking to Waller, but the legspinner held his nerve having been taken for 14 from the previous three balls to have Smith superbly stumped by Craig Kieswetter. However, when Yardy fell cheaply Sussex were in danger of wasting Smith's effort. Then Chris Nash, fresh from a Championship hundred, adapted his game to hit 28 off 22 and Yasir Arafat added 20 off 13 balls as the pair put on 46 in the last five overs. It wasn't quite a blitz, but it meant Somerset would have to achieve the highest success chase on Finals Day. For a short while it looked possible, but the spinners once again reigned supreme in Twenty20.